Zex N2O Kit - Diesel System - Dezod Motorsports Inc - Home of the automotive performance enthusiast since 2002. Reduced turbo lag and improved throttle response with cooler exhaust temperatures! Performance enthusiasts know the potential of nitrous oxide injection systems to generate big horsepower gains. For diesel engines, the installation of a ZEX Diesel Nitrous System adds great power with no additional tuning, but offers huge power gains when used in tandem with power programmers that add additional fuel. By more thoroughly burning the increased volume of diesel fuel entering the engine, the ZEX Diesel Nitrous System increases power, reduces exhaust gas temperatures, and gets rid of excessive exhaust smoke. The ZEX Diesel Nitrous System improves wide-open throttle response, reduces turbo lag, and greatly cools the inlet air temperature for maximum air density and power. Nitrous oxide gas provides the extra oxygen you need to safely burn more fuel when tuning with your diesel engine programmer. The ZEX Diesel Nitrous System is a complete kit that includes everything you need for an easy, plug and play installation. 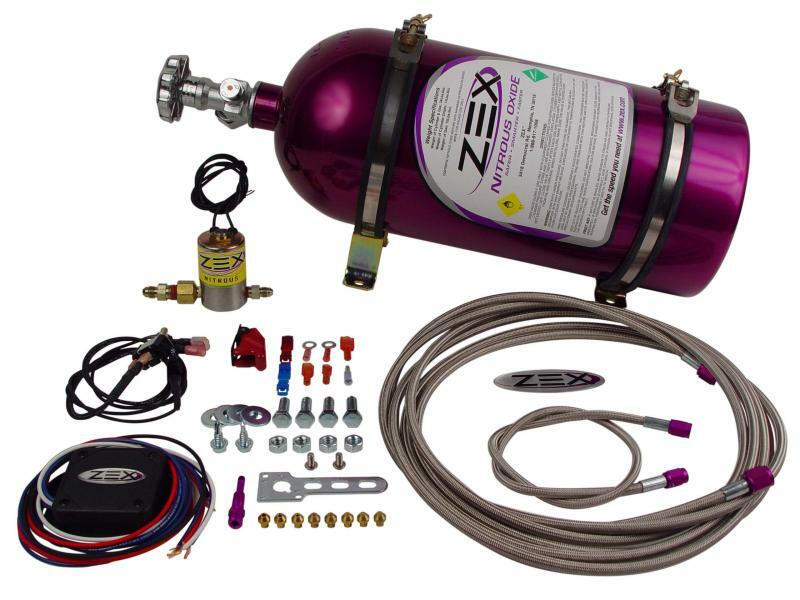 The ZEX Diesel Nitrous System includes a 10 lb. nitrous bottle, brackets, electronic throttle activation switch as well as all the plumbing and electrical connectors.